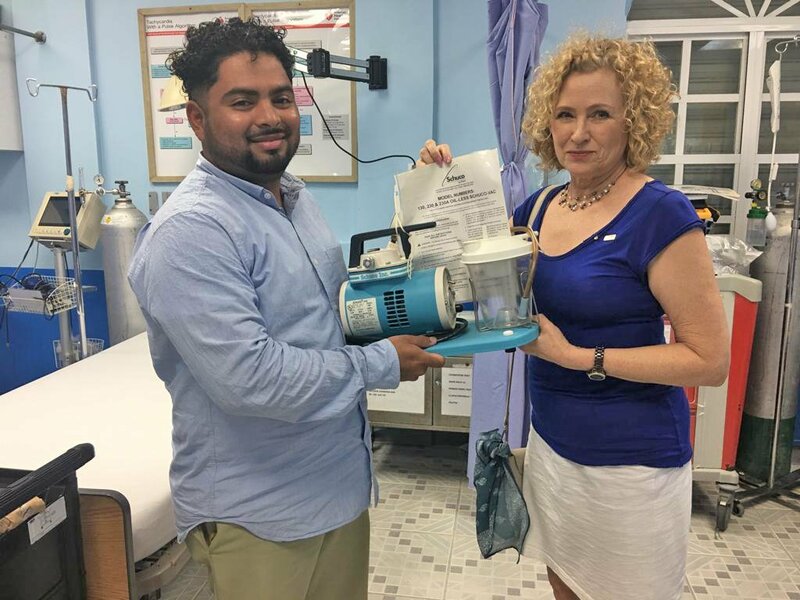 A new suction pump was donated to the Dr. Otto Rodgriquez San Pedro Polyclinic II on Thursday, February 7th by the Rotary Club of Ambergris Caye. Administrator Eric Najarro was on hand to receive the equipment from Rotarian Diane Tabony. The Polyclinic had been operating without the much-needed equipment for weeks after their pump stopped functioning. The island’s Rotary Club was made aware of the situation, and members were happy to assist the medical center in acquiring this important medical tool. Tabony currently takes care of all projects regarding the Polyclinic, along with Rotarian Pete Davis. She shared with The San Pedro Sun that when they received a notice last month that the Polyclinic’s suction pump was not working, they began looking at ways to help. Tabony explained that they were in touch with Rob Cadick from TrimedX Foundation in the United States of America (USA), who has visited the polyclinic in previous times to inspect its equipment. She said that within days, he advised them of an authorization for the island’s Club to receive a Schuco VAC Suction Pump they had in stock. Cadick covered the freight cost from the USA. “Another instrumental person was Ramon Turcios from D2D Courier Service, who handled all the shipping, clearing, and made sure the pump arrived in San Pedro just in time,” said Tabony. Najarro thanked Tabony and Rotary Club of Ambergris Caye for their generous donation. The pump is a very important piece of equipment that is used to clear the airway of blood, saliva, vomit or other secretions so that a patient may breathe. The use of a suction pump also prevents pulmonary aspiration, which can lead to lung infections. The island’s Rotary group remains committed to serving the community in any way possible. In June 2018 they donated dozens of boxes of medical supplies to the Polyclinic, which up to present day has kept them well stocked. According to Tabony, the Club and Najarro continue an excellent working relationship and maintain dialogue on how Rotary can continue supporting his hard-working medical staff. The Rotary Club of Ambergris Caye extends an invitation to any interested persons that may want to become involved in their mission to contact them by calling 653-4806 or via their Facebook page at Rotaryclubofambergriscaye.